I finished Sleepy Hollow today. Slightly over a month of work. My stash for the month included some non-cross-stitch items. I also finished 2 pairs of beaded earrings. So onto a new project for the 2nd half of 2015. I'm late again, I know. But I have a really good excuse this time. 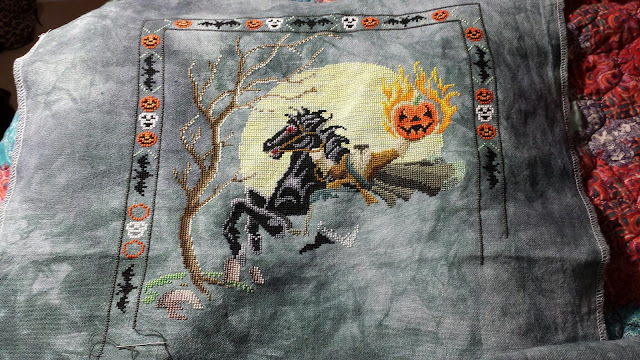 I waited until Sleepy Hollow was finished! 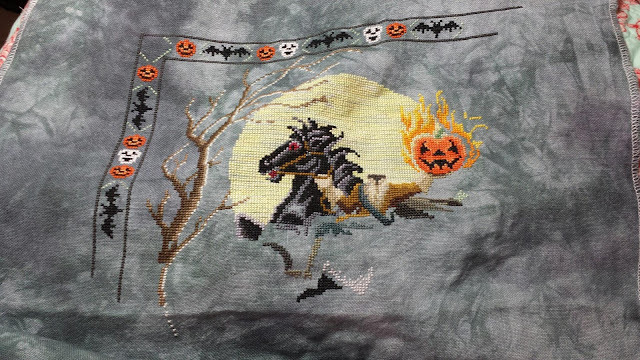 I forgot how long it can take to backstitch something. Anyway, onto some crochet this week until I decide upon my next cross-stitch project. 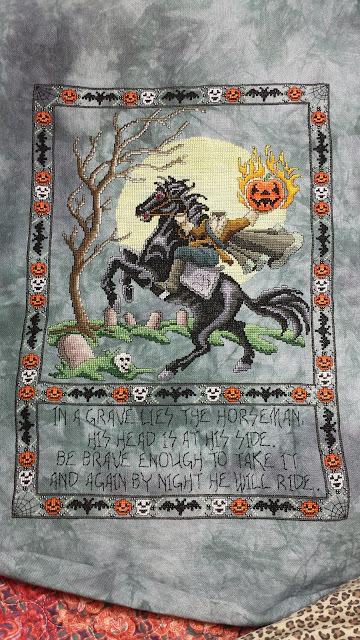 Sleepy hollow has a new skull and most of the horse completed. Once I finish this page it's mostly border, then I get to start the backstitching. Also made earring from kits I got in one of previous stash purchases. The colors aren't the best. The first is a dark blue/purple mix and the second is three shades of purple. Then there's Onyx. Can you tell I love my cat yet? And finally the other stash that accompanied the fairy I posted last week. A little late on the post due to my work schedule. You can see the headstones starting. Onyx has decided to rest her head on my leg, she's rarely on my bed anymore now that I don't have the fuzzy leopard comforter on my bed. I also fell prey to Herrschners latest sale. Got a lot of christmas crafts. But also bought this kit. It was on sale for half the regular price and I had a 10% off coupon from my last purchase from them. Held off on two other kits I was eying. I worked a fair amount this week and didn't get as much stitching done as I would like. 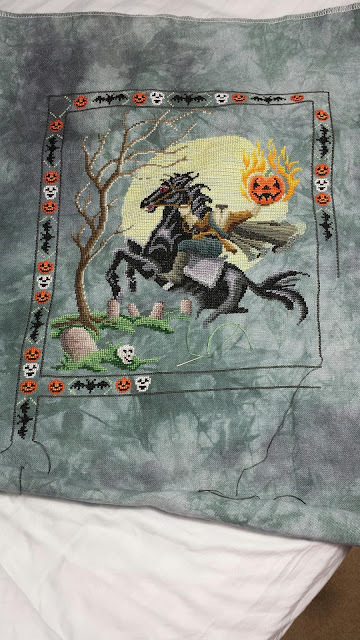 But I've added sparkly thread to Sleepy Hollow.